“Great,” he said, though without as much enthusiasm as he should have had. Marcas looked at The Doctor and felt as if he had been privileged to see into his real feelings beneath the shell of self-assurance and self-reliance. He stopped talking. Susan and Marcas both stared at his face and felt an ominous chill. He looked as if somebody had just broken the news of a death to him. But he wasn’t listening to her. He was concentrating very hard on something beyond the TARDIS, beyond the three of them standing there. She touched him and he didn’t even blink. “Dominic,” he whispered suddenly, in a voice that was filled with grief. “I don’t know,” The Doctor admitted. “I just know that my son is hurt. I don’t know about anyone else. I can’t.…” He looked up at her. He had been about to say that he couldn’t care for anyone else. But that was not true. Of course he cared for ALL the people of that beautiful place where his wife and son lived. He cared for Susan’s own sweetheart who might be in the same danger his son was. He ran to the console and began rapidly pressing buttons, changing course for Forêt. He looked at a panel next to navigation and frowned. He hit the panel with the rubber mallet kept in a receptacle on the console for just such delicate manoeuvres. A purplish light started blinking. The Doctor gave an anguished cry. “The mauve alert. Dominique was trying to reach me, trying to tell me there was something wrong. She activated the crystal I gave her. But… the bloody light wasn’t working. Bloody stupid.…” He kicked the console hard. Susan was shocked. He loved the TARDIS. He cherished it. He would be more likely to kick a dog. “She let me down. She let HER down!” he said in a hurt voice. The TARDIS must have heard him. The central column glowed a brighter green as if it was responding to his pleas. There was a change in the tempo of the engines and Susan looked up at the viewscreen. She was sure they were going much faster than usual through the vortex. The TARDIS was making up for its error by putting in every ounce of its power for him, now. Before it’s too late! As they stepped out onto the usual place on the platform among the trees of Forêt it looked as if it was ALREADY too late. They all of them stared at the scene of devastation. Marcas had no emotional tie to the place, but even he felt a chill of apprehension. The treetop village had been ravaged by somebody or something that pulled thatch from the roofs and broken down walls. Few of the huts were undamaged. The Doctor looked at the workroom where Dominic and Dominique worked at their weaving and spinning and painting of cloth. The whole of the front of the hut had been broken in and he could see at a glance that the loom and spinning wheel were splintered and broken and the bags of raw silk spilled over the floor as if somebody wanted to destroy their work. “Go and check over there,” The Doctor said to Marcas, pointing towards the other side of the bridge. He himself ran for the ladder that brought him to the living quarters of Dominique’s tree home. She wasn’t in the room where the food was kept and where they cooked and ate in cold weather. She wasn’t in the bedroom above, though he saw signs of struggle. His hearts lurched as his imagination went into overdrive. A scream rang out and he turned and looked out over the balcony. It came from the other side of the clearing, in the hall of Devotions, and as he watched he saw Marcas coming out of the hall backwards, and a woman with a knife urging him to move faster. He grabbed a liana rope that was tied to the balcony. Dominic never used walkways or stairs if there was a rope handy. He took a deep breath and swung. He vaguely heard Susan shout to him as he passed over her head and landed a little ungainly but safely by the Hall of Devotions. That she needed help was obvious. She looked as if something or someone had beaten her severely. Her face was cut and bruised and her dress was torn. Her bare arms showed the marks of rough hands holding her tightly. And the frightened whimper she gave when Marcas tried to move closer told him more than he needed to know. “Dominique is here,” Inès managed before fainting. Marcas caught her and lifted her into his arms. The Doctor nodded and told him to go back into the hall with her. He came too. Susan followed behind. Inside, lying or sitting on the floor, were the women and children of the village. The children seemed only frightened, but the women, young and old alike, all looked as if they had suffered the same rough handling and worse. They all shrank back from The Doctor and Marcas. “Doctor,” a voice cried, and a young woman ran to his arms. It wasn’t his wife. It was Thérèse, Dominic’s young sweetheart. She, too, was bruised and hurt and she couldn’t speak at first. When she did it was a confusion of words that told him nothing. “She’s in the side room, with the Women,” Thérèse told him at last. He was puzzled by that phrase. The room was full of women. They all needed his help, but he wanted to go to Dominique. The Doctor nodded and ran to the wickerwork door of the side room, used normally for special contemplations and quiet prayers. It was no quiet place now. It was a place of pain and distress and as he entered The Doctor realised what the word “Women” with an almost spoken capital “W” had meant. “Let me,” he said, and the two middle aged women moved aside as he knelt by the low bed and looked at her. “Dominique,” he whispered as he touched her bruised and swollen face. He looked up at the Women. There was a question on his lips, but he couldn’t get it out. “There is nothing anyone can do but let nature take its course,” the older one told him. There was nothing he could do either. He couldn’t turn back time. Not when it was like this. He, the Lord of Time, had to accept the inevitable. All he could do was be there now for her. “Taken where?” he asked. She couldn’t tell him. She was in too much immediate pain. “Let’s do it the easy way,” he told her and he placed his hands either side of her head gently. He closed his eyes and opened the door into her mind. At first the short term memories were too confused to make any sense, but as he soothed and calmed her he got a clearer picture. They had welcomed the strangers who came. Even though their appearance had been alarming, they had extended hospitality. They had given them food and entertained them in the village. The strangers had expressed an interest in their culture and nothing more, admired the silk paintings, enjoyed a demonstration of their sport in the arena. And it had all seemed perfectly normal. Their leader, a man called Gegocoi Viturthin, had spoken of trade with Forêt, and didn’t seem at all upset when Dominique told him that they had no interest in intergalactic trade. He had smiled warmly and spoken of his admiration for their simple, satisfying lifestyle. But in the night, the strangers returned in greater numbers. They ransacked the village. They forced them all into the Hall of Devotions and separated the men and boys from the women. The men had been taken away, but first, the women had been systematically beaten, as a warning to the men. If they didn’t co-operate, worse would be done. As he withdrew from her memories The Doctor felt his anger rising, along with a feeling of revulsion against what had been done to these gentle people, and especially to the ones among them that he loved dearly. His hearts burned with fear for his son. But he couldn’t leave his wife. “You need me,” he insisted. She was right. All his medical knowledge couldn’t undo the damage done. The Women of the village who knew about these things could do as much as he could. He was needed elsewhere. “I can do one thing, at least,” he said, passing his hand over her forehead. “Bear this trouble with less pain.” Her anguished face relaxed a little as he drew off some of the agony. He kissed her bruised lips gently and stood. The other women, back in the main hall, were all suffering too, And they, too, once their physical injuries were treated, needed one thing more than anything. They needed THEIR men, their sons, husbands, fathers, brothers. He was the only one who could do anything about that. He looked around and was surprised to see Marcas sitting on the floor, still cradling the young woman who had been prepared to stab him before. She had regained consciousness, but she was clinging to him as if he was the only certain thing in her world. Marcas tried to stand, but Inès clung to him. Despite being traumatised by men, despite her first reaction having been to stab him, she was reluctant now to let him go. The Doctor came to her side. She looked at him fearfully and then buried her face in Marcas’s chest. She didn’t want any other man to touch her. She had bonded with Marcas but no other man, not even The Doctor, would do. The Doctor thought it was more a case of he couldn’t leave HER alone. But that was understandable, too. There was a sudden scream in a room where groaning and crying was a constant backround noise. The Doctor looked around. It was Susan who had screamed. She was already running to the broken door where Miche stood, looking exhausted but alive. Susan wrapped her arms around his neck and smothered him with kisses until The Doctor reminded her that their species needed to breathe. “Count on me, Doctor,” he assured him. Miche WAS tired. But he wanted to help. He rallied himself and came with The Doctor to the TARDIS. “Oh my!” he murmured as he stepped across the threshold. Miche came and sat on the command chair that The Doctor himself so rarely used. Miche knew that when he visited Forêt he could sit still for hours, weaving cloth with Dominique at his side. But here in the TARDIS, he was charged with the same mysterious force that made the strange machine glow green and emit an almost animal sound. Miche gasped as he looked at the viewscreen. He didn’t even know they had moved, and now he was looking at his world that always seemed so big to him, as a ball hanging in the sky. A beautiful ball of blue and green and white at the two poles. “What are those?” Miche asked. “Until now,” The Doctor said with a frown as the TARDIS revolved away from the planet and they both looked at the alien ship that still hung in orbit. Miche didn’t say anything. He was still coming to terms with it all. Dominic was the only one of his friends who had ever been in space before, taken by The Doctor on one rare occasion. He couldn’t begin to imagine how frightening it was for the others, taken forcibly to something so alien to them as that dark, forbidding ship. “I’ve found them,” The Doctor said as he looked at the lifesigns detector that showed him the position of every living being on the ship. “That’s Dominic,” The Doctor said, pointing to the one lifesign blip he would always be able to pick out from all the others. “He’s on the bridge.” Then his finger traced a route from the bridge to the hold where the men of Forêt, innocent men and boys were incarcerated. They all needed his help, too. Miche looked at him and wondered how he would choose which to help first. He spared one brief glance at the tiny blip that proved his son was still alive at least. He WAS worried. There was no way to tell what condition he was in. He could be near death. He could be unconscious. He hadn’t felt his son’s telepathic connection since that desperate, grief-stricken call. He had tried to reach out mentally several times and found nothing. It might just be that he was tired. Dominic was not yet well trained in using his telepathy and it took a lot of mental effort to send a message across long distance. The ordinary, wonderful chats he had with his son always left the boy worn out. It was possible that he didn’t have the strength to reach him again after sending that urgent message. He almost changed his mind in the split second before he programmed the materialisation. He hoped Dominic WASN’T hurting. He hoped he would forgive him for leaving him a moment longer than he had to. But he knew his first instinct was the right one. He carefully calibrated the co-ordinate to bring them inside the densely packed hold. He set a broad materialisation and some thirty prisoners suddenly found themselves sitting or lying on the mesh floor of the TARDIS. The Doctor picked his way between them and opened the door. Outside the bulk of the prisoners were starting to stand up and stare. Those who came from Dominique’s village and were familiar with the alien blue box knew that it meant rescue of a kind. Their optimism spread through the others quickly. He paused in his rallying cry. The door to the hold was opening. He turned and looked as three of the enemy who had caused them all so much harm stepped into the cell. They were, as he had seen in Dominique’s recollection, clad in what looked like space age chain mail with a huge helmet that covered the head completely. They had energy weapons of some kind which they aimed at the prisoners as they pushed their way through to the TARDIS, demanding to know what it was and how it got there. The Doctor didn’t think about it. He acted on instinct. He acted on the sick feeling that had driven him since he had arrived on Forêt, on the second hand memory of the men that had come in the night and hurt his wife and kidnapped his son. He crossed the floor in a few fast strides and grabbed the gun from the nearest man. In a flash he turned it and pulled the trigger twice before turning and shooting a third time. As the third man fell the helmet cracked open and he looked into a face that wasn’t that of an alien thug, but an ordinary human face - a slightly built man with a pale face that hadn’t seen sunshine for a long time. The armour and the helmet had made him appear bigger and stronger. Perhaps there were hydraulics of some kind in the suit that DID give them extra strength, but inside was an ordinary man. The Doctor bit back the instinct to kick the head until it was as bruised and bloody as the women he had left on the planet. “No,” The Doctor murmured as he saw a flicker of movement on the face of the soldier. “No, he’s NOT dead.” Relief flooded through him. He knew he had no cause to feel pleased. In the moment when he turned the gun he had WANTED to kill, and that bothered him. But fate had decreed that this time there was no blood on his hands. “The armour took the brunt of the energy ray,” he said as he examined the man more completely. “He was just stunned. He’ll live.” He adjusted his sonic screwdriver and used it to revive the man. It wasn’t a painless method. It was like being shocked awake. But he needed to speak to one of these men. He needed to know what it was all about. “Some kind of hypnotic control,” The Doctor said, to nobody in particular. Then his face hardened. “Unless it’s a trick, to get me to trust you.” He reached out and put his hands either side of the man’s face and concentrated. He saw his mind easily. It was a confused, hurt mind of a man who had been snatched from a peaceful farming colony in the Beta Epsilon system and made to live a nightmare for so long he had almost lost his own identity. He checked deeper, to see if that was just a cover story in front of a mental wall that hid the truth. There was nothing. “I…” The man’s face screwed up in concentration. He couldn’t remember. The Doctor touched his forehead again and with a little effort he found the answer for him. He looked around and selected ten Forêteans, all strong me, hunters who caught the meat that fed the village in winter. He picked up the discarded guns and gave one to Miche and one to the strongest of the Foretean hunters. The third he gave back to Thomas. “They’re my friends, people from my village,” Thomas protested. The principle was simple. They had the element of surprise. They had a group of prisoners apparently being led by a helmeted soldier. So the two who marched into the corridor outside the hold didn’t even raise their weapons. And that meant they had five guns now. The next time was even easier. They moved through the ship, towards the bridge. By the time they got there they were all armed. The Doctor fingered the trigger of the weapon in his own hands and wondered what he was going to do when he faced the one responsible for the grief and anger he was barely holding inside him. Taking the bridge was relatively easy. The Doctor led the charge. He fired without a second thought at the armoured men who blocked his way. The Foreteans behind him, and Thomas, fanned out and quickly brought everyone under their control. Gegocoi Viturthin was in the command chair. Captain of the ship. Two of the Foreteans moved forward and flanked him, their weapons trained on him. The Doctor stood in front of him. His gun pressed against Viruthin’s forehead. His finger pressed just slightly on the trigger. Viturthin blanched. Like most bullies he was a coward when he was outnumbered. “Where… is… my… son,” The Doctor demanded. “Doctor!” Miche called urgently. 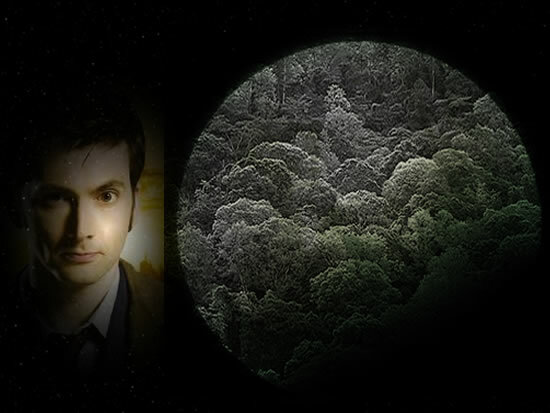 The Doctor turned and he blanched, too, from shock, not cowardice. “Dominic!” he cried as he ran to the navigation console. He stared at the boy. It WAS Dominic. But he was connected by wires and sensors to the navigation computer and he was rigid and unmoving. The Doctor knew at once what Viturthin had done. Dominic was telepathic. He could be used to pilot the ship faster and more accurately, to reach the wars they wanted to reach so much more easily. But it wasn’t working. Dominic was concentrating hard on NOT navigating the ship. 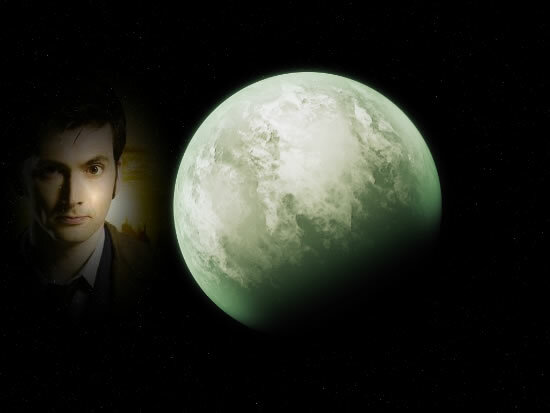 The Doctor looked at the console and saw that it was locked in geo-synchronous orbit above his village. He wasn’t letting them take him away from the home he loved. He was the reason the ship was still here. He overrode the controls, releasing Dominic from the circuits and manually locked off the same orbit before he began to unplug his son from the machine. As he did so, Dominic slowly came out of the deep trance he was in. He blinked and looked at his father. Tears of joy mixed with fear and grief filled his eyes as The Doctor lifted him from the seat. “Of course you did,” The Doctor answered with a smile. “You can always depend on your dad in a crisis.” He hugged him tightly. For a few minutes the universe was a small, private place containing the two of them. Miche’s urgent voice brought him back to the business at hand. He looked up at the main screen and smiled. The authorities had been faster than he expected. Two intergalactic police ships were moving in alongside the pirate ship. He held his son by the shoulders and turned to walk away. As he did so, Viturthin screamed in rage and jumped up from his seat, grabbing the gun held by the Forêtean man who was guarding him. He levelled it at The Doctor’s back. Then another hand squeezed another trigger. Viturthin slumped back into his chair, dead. Thomas lowered his gun. “That was for MY family,” he said. The Doctor couldn’t blame him for that. He came close to doing it himself. “Yes.” The Doctor’s voice caught as he spoke. His mind turned again to Dominique. He hadn’t dared to while he was in Viturthin’s presence or squeezing the trigger of an energy weapon wouldn’t have been enough. Now he let himself grieve for the failing heart of the seven month foetus within Dominique’s bettered and broken body that the Women of he village knew there was no hope for. And that was the only reason why he hadn’t. Because Dominique would not have wanted him to do it. The galactic police offered to take the Forêt men home in shuttles. Those from Dominique’s village chose The Doctor’s offer to travel by TARDIS. He programmed it to materialise in the Hall of Devotions. The joyful sounds of reunion that broke out among the people cheered his unhappy hearts. There would be a lot of healing to be done here, but that was the thing about humans. They DID heal. He didn’t ask why. He raced across the room to the wicker door. His hearts thudded with dread. Dominique was sitting, propped by cushions now. The pain and exhaustion she had endured told on her face. He felt again his revulsion for Viturthin as he looked at the tiny, cloth-wrapped bundle she held close to her. They had let her hold the child long enough to say farewell, he supposed. “Let me,” he whispered hoarsely as he knelt by her side. Dominique pressed the child into his arms. She was only a little bigger than his hand. Too, too young. Then his grieving hearts thudded. He felt the tiny baby move. He saw the eyes open and then screw up again as it opened its mouth and cried a little cry, more like a kitten’s mewl yet. He looked up and saw Dominique smile joyfully. He felt the presence of Dominic and Susan behind him. “But.…” He passed his hand over the baby and felt her vital signs. Her heart was strong. Just the one, he noted, but as strong as two. Her lungs had a little fluid in them still, and her kidneys and liver might need careful attention. But she WAS alive. Her brain functions were normal. She was just too, too young, too small. “I am.” He burst into tears. He felt Susan take the child from his arms and give her back to Dominique. He felt his son embrace him and he heard Susan and Miche and the two Women to whom he would be eternally grateful leave the room, closing the wicker door behind them. For a very long time his universe was again a small place. But it was a joyful place. They named the child Angeletta. It was French for little angel. Despite all the odds she got stronger. The Doctor put it down to his genes at work even in her mostly Human body. But mostly he did as Susan suggested and he didn’t question the miracle. Instead he went about the tasks of repairing their home, their village, along with the other men of Forêt. They slowly recovered from the trauma that had almost destroyed their paradise. “Even she isn’t enough to keep you here though,” Dominique said as she sat on the swing seat on a peaceful, starlit evening. The Doctor held his baby in his arms and listened to her soft breathing. “I always do,” he assured her. He looked up at the bright stars. Yes, he had work to do out there. He couldn’t stay. But he COULD come back whenever he wanted. And he WOULD. “Who will go with you when you go?” Dominique asked as movement in the walkways above caught their eye. There were three pairs of lovers walking quietly in the starlight up there: Dominic and Thérèse, Susan and Miche, and Marcas and Inès. “THAT is a very good question,” The Doctor noted with a smile. It was a question that was settled in the days that followed. And settled in a way that seemed satisfactory to all. But one other couple had other plans. The Doctor was equally content as long as they were absolutely sure it was what they wanted. Miche had just one request of him. After he had said his goodbyes to Dominique and Dominic, he was more than willing to fulfil that request. Miche and Susan watched the viewscreen as a wave of energy was emitted from the TARDIS. It expanded until it surrounded the whole planet and the planet faded from view.